I think I heard about Minor Case prior to its release, though I can't be sure. It certainly did not have a bunch of hype surrounding it, but I recall being intrigued by a rye offering from the same people that make Yellowstone Bourbon. To be completely honest, the real reason I grabbed this, aside from the simple fact that I was looking for a new rye to try, was the incredibly handsome bottle they decided to put the whiskey in. Three different people commented on the bottle just on my way out of the store. Great looking bottle aside, what matters is the juice contained within. To Limestone Branch's credit, they do provide an age statement on the back of the bottle, letting us know that the rye was aged for 24 months, though we don't know how long it spent finishing in the sherry casks. They are also up front that the rye was distilled and aged in Indiana (so it's MGP rye), and was bottled by Limestone Branch in Kentucky. The nose, as expected with a sherry finish, was soft and fruity. It came across as a light, crisp raspberry scent. I hunted for some of the traditional rye spice on the nose, but just couldn't find it. On first sip, it hit me as being simple, on the sweeter end, and it carried that fruit from the nose over to the palate. Again, as with the nose, raspberry notes seemed to stick out. Interestingly, despite this being a two year old rye, it had a relatively long finish, though it was that raspberry note that stuck around for so long. It's probably because it's a young rye, but I really wanted some traditional spiciness, a little bit of cinnamon to push its way through the berry notes. Although the spiciness wasn't there, what was left was a very, almost refreshing pour, something that would be very enjoyable over ice during the Summer. Though the flavors were good, it did come across as a bit watered down. It was, however, very easy to drink with almost no burn whatsoever. About half way through the bottle, it seemed to sweeten up even more, coming across more like a dessert or after-dinner drink, with a certain creaminess added to the fruity notes. Enjoyable flavors of vanilla and nougat seemed to compliment those notes. 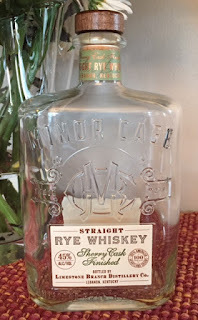 Though it's not what I'd traditionally enjoy in a rye, and it ultimately did not satisfy my rye craving that led me to the store that day, I did find myself happily going back to the bottle for seconds. I didn't like it for what I hoped it would be, but I did enjoy it for what it was, even if only for the novelty of it. In the end, I might buy a bottle again, but I think the mood would have to hit me just right. If it's a solid rye whiskey that I'm after, though, this isn't the bottle I'm reaching for.